An EMS-induced single-base mutation at a splice site caused abnormal RNA splicing and resulted in the gene inactivation and the lack of Wx-A1 protein in a wheat EMS mutant line. 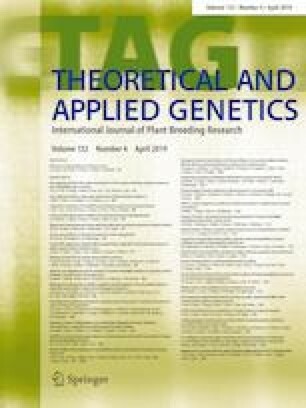 An EMS-mutagenized population was generated using common wheat cv. SM126 consisting of 10,600 M2 plants. One Wx-A1 null mutant was identified through analyses of 390 grains produced from 130 M2 plants using electrophoresis analyses. The Wx-A1 sequences of parental line SM126 and M2-31 mutant were determined as 2781 bp, and there was only one SNP mutation between them. The SNP was a mutation from G to A at nucleotide sequence position 2168 bp (G2168A) downstream of the start codon which was located at the splicing site within the eighth intron. All 52 cDNA transcripts were found to be incorrectly spliced and can be summarized as five types of variations. The deletion of the exon and the exclusion of intron were structural features in abnormal splicing RNA. Together with the prediction of potential splice regulatory motifs, the mutation G2168A happened within the 5′ splice site of the eighth intron and destroyed the splice donor site from GU to AU, which may have brought about a barrier against correct RNA splice, and generated abnormal mRNA, which was the mechanism of the inactivation of Wx-A1 in M2-31. The lack of Wx-A1 has resulted in changes in starch properties in the M2-31 mutant, with the reduction in amylose and starch contents. The increased grains hardness was observed in M2-31, which may be related to the lower expression level of Pinb-D1 gene. As the waxy wheat foods have a lot of advantages, the null waxy genes will be widely applied in breeding waxy wheat for varied amylose contents. Communicated by Ian D. Godwin. Mi Luo and Jinjin Ding have contributed equally to this work. This work was supported by the National Key Research and Development Program of China (2017YFD0100900), the Technological Innovation Project of Chengdu, Sichuan Province, China (2018-YF05-00059-SN), and the Technology Foundation for Selected Overseas Chinese Scholars, Ministry of Personnel of China (No. 2014-4). LM contributed in performing the experiments and drafted the manuscript; DJJ developed the mutagenized wheat population; LY and THP performed the waxy proteins analysis; QPF and MJ cloned the Wx-A1 ORF and analyzed the sequences; WJR and CGY developed the KASP marker. PZN and LW cloned the cDNAs of Wx-A1; LZY performed the RT-qPCR; WH analyzed the content and granular morphology of starch; LXJ analyzed Ha locus and seed hardness. DM and LZX analyzed the data; WYM and ZYL provided suggestions about the research, and JQT designed the experiments and revised the manuscript. All authors have read and approved the final manuscript.